Art Sqool sucked me in early on. My second in-game assignment was to draw slowly and deliberately. It was a tall order for drawing with a mouse, but I gave it a fair shot. I made sure I traced my lines slowly, with purpose, really considering each stroke and what it added or took away. As I kept drawing, I realized how much I was losing myself in the process of making art. 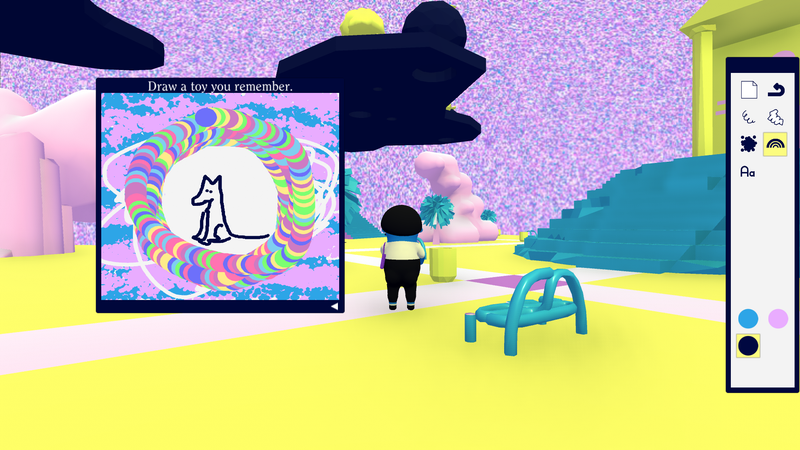 Art Sqool is a game from Julian Glander, a 3D artist who has done illustration work for Wired, The New Yorker and Adult Swim. In it, you play a first-year student at an art school called Art Sqool, named Froshmin. You get assignments from your professor, a self-described neural network that judges you based on your technique. Between assignments, you explore your school’s campus to find new swatches and brushes. The gorgeous scenery is what first attracted me to this game. Glander’s previous game, Lovely Weather We’re Having, was a pleasant stroll through an alien neighborhood of bright, bulbous flora and fauna. That aesthetic returns in Art Sqool, where I amused myself by looking for the hidden frog faces in the architecture while I grabbed a new color swatch. The drawing assignments are what makes Art Sqool special. I used to make art; specifically, I made experimental videos in college during my cinema studies degree. I had thought I might be an artist, then decided instead that I wanted to be a museum curator, and now I am a journalist. It’s been a long time since I flexed my artistic muscles, so I wanted to take the assignments in this game seriously. The game eases you into this with some humor. The first assignment is to draw a perfect circle with your non-dominant hand, which I know is an actual first year art school assignment that some of my friends have had to master. You don’t actually have to draw the things you’re assigned to draw in Art Sqool, though I found that the prompts gave me some focus. For some of the assignments, I went off and did my own thing. I was simply not going to be able to complete “in a photorealistic style, draw something that cannot be photographed” to my own satisfaction with a mouse. As I continued to play, I found that just taking the process of making art seriously made me feel more creative and produced better drawings. Sometimes I meet people who tell me they don’t like contemporary art, and it depresses me. I do have some bias, as I have friends who are artists, contemporarily. But theirs isn’t the only contemporary art that I enjoy. Whenever I go to an art museum, I find myself overcome with love and admiration for people who make even the things I don’t like. Art enriches our lives, asks us hard questions, and shows us delight in small moments. The last exhibition I saw, a retrospective of the artist Charles White at the MoMA, was filled to the brim with both images of black pain and the beauty of black life. Sometimes, when people see something so intense and so earnest, they react by processing it through their own cynicism. That allows them to to deny themselves the pain of feeling such a strong emotion directly. It’s hard to maintain that cynicism about art when playing Art Sqool. I know some people will spend time drawing dicks in this game, and the game’s sly humor is not unwelcome to players’ flights of fancy in that regard. Whenever you get graded, you’ll never receive an explanation for why you’re getting a B or a C or an A, just a bar graph charting your “approach” and “color,” among other criteria. After making a half dozen drawings, I just started drawing for the pleasure of drawing. Once I had completed fifteen of the fifty assignments, I felt like I’d tapped into a new avenue for appreciating art, one in which I could experience the joy of making a mark on a canvas myself. There’s a bit of a disdain for the institution of art school in Art Sqool, but don’t mistake that for a mockery of art itself. If you let yourself enjoy making something, you might just fall in love with a whole new world of experiences.